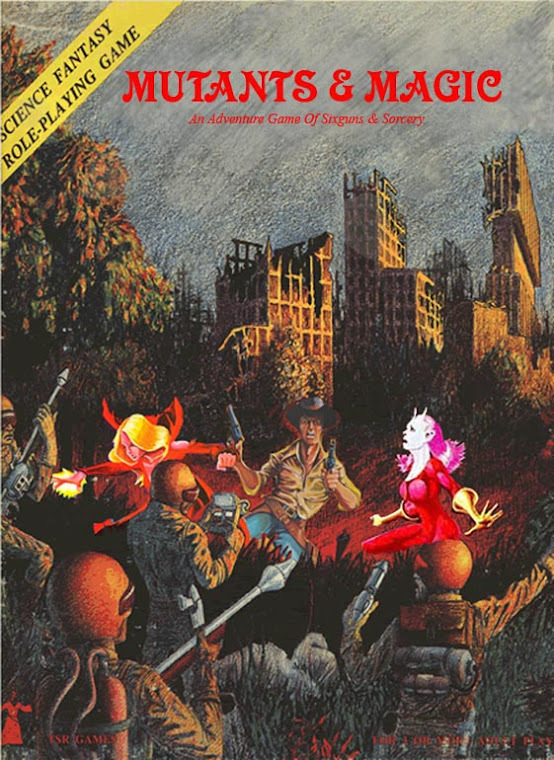 +Joey Lindsey has a contest on his METAL vs SKIN blog for a copy of Doom Cave of the Crystal-Headed Children, an adventure written for the Lamentations of the Flame Princess RPG. Plus another adventure written by Joey himself and other runner-up prizes. Air. Earth. Fire. Water. Since time beyond mortal understanding the primal elements of the world have struggled for dominance over one another. At the forming of the world, Earth called out to a mountain from beyond the sky. The mountain pierced the Air, boiled the Water, embraced the Earth and awakened the Fire below. The balance of the elements is inevitable . The mountain was shattered, leaving a colossal wound in the Earth. Water rushed in to claim the new void. Fire boils and churns from beneath, never allowing the scar to heal. Still to this day Air lashes the area with raging storms and blasts it with bolts of furious fulmination. 1. The Puzzling Desert - This dry waste was once home to a thriving civilization that was long ago conquered by wizard allies of the elemental plane of Earth. The people were transformed into living husks who don't need to drink water to survive. They are trying to deforest the surrounding landscape and expand the desert. 2. Port Underfoot - This town is a known smugglers den. Anything goes as long as a hefty tribute is paid to Nix and Nox, twin ogre magi. They control an impressive fortress on Mount Overhead to the south. Any who disrespect the ogre magi or their enforcers are thrown into the shark infested reefs nearby. 3. Island of the Astrologer - On the southern shore stands an ancient stone lighthouse. A huge enchanted telescope has been built into the top of the light house. The astrologer wizard who lives here can summon creatures represented in the constellations to do his bidding. 4. Segar Isle - Rose the sea hag and her vulture familiar make their home here. She is served by a small army of degenerate pink tropical kua-toa. They believe she is an avatar of the Sea Mother, their elemental water goddess. She can also be found terrorizing the seas in her pirate ship, the Black Barnacle. 5. Lost Adakkor - Here lie the ruins of the civilization that suffered the curse of the Puzzling Desert to the north. A few noble families and their retainers remain here in the hopes of finding a way to defeat the elemental earth wizards and reclaim their people and their country. 6. Aerie of Megaira - Megaira the gynosphinx rules these mountains and commands an army of corsairs. She resides at the peak of the mountain in an ancient temple of the air elemental Boreus. She and her pirates ply the seas in search of weaker ships to plunder. 7. Brakoora Isle - Despite its sparse vegetation, this island supports a small human population.Traders who frequent the island tell tales of nocturnal rituals on the beaches and the hunched silhouettes of huge, clawed beasts that crawl from the surf. 8. Aerie of Aella - Aella the gynosphinx makes her home here in the ruins of an ancient college on the slope of this dormant volcano. She spends most of her time studying occult tomes in the library. It is built like a vault, with walls of adamant steel and sealed with sturdy locks and magical wards. 9. Knucklebone Isle - A family of oracles makes this island their home. They are famous for casting the knuckle bones of their ancestors to foretell the future. It is said to harass them is to invite calamity and doom. 10. Aerie of Kimon - The criosphinx Kimon guards a forgotten prison at the top of the mountain. For the right price one can bribe Kimon to abduct one's enemies and lock them in a cell here to rot. He is constantly trying to impress and seduce the sphinx sisters, Aella and Megaira. 11. The Quickmire - This island is covered in brackish swamp and deadly quicksand. There is spring near the north shore of the island whose waters are said to make the drinker invulnerable to the stone gazes of the basilisk and medusa. Giant shark-form lamias hunt the waters around the island. 12. Jub-Nelumbo - Villages in this area produce a variety perfumes from rare tropical flowers. The plants are also sought by alchemists and poisoners for their toxic properties. 13. 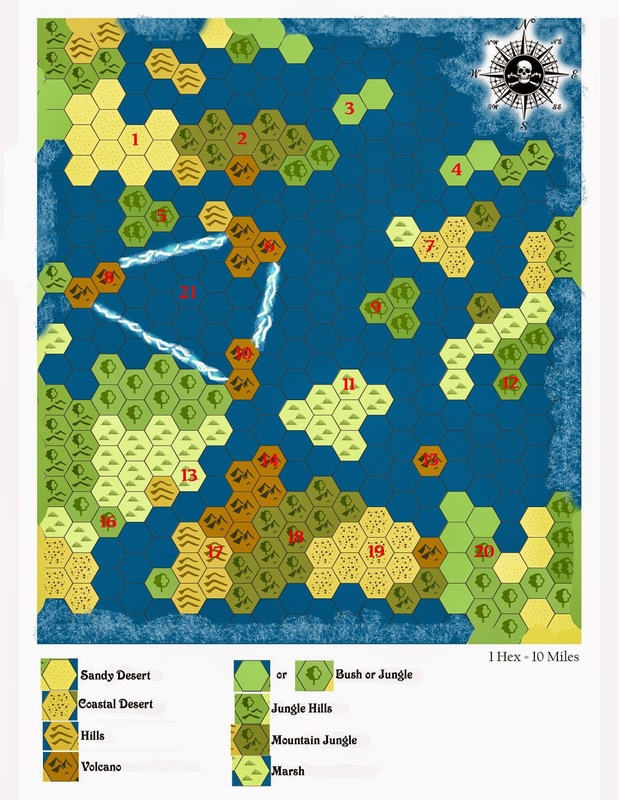 Muckmarsh - The soggy wilds of Muckmarsh are dominated by insects of every sort. Explorers tell tales of dense swarms of bugs that imitate the shape of men and speak an alien language in buzzing voices. 14. Charmaw Peaks - This entire mountain range boils with volcanic activity. The tribes here are lead by shamans who channel and transform into fire elementals. They have dire plans for the kingdom of Akandwa to the south. 15. Mount Jak'Irby - Jak'Irby the storm giant resides here in a palace carved around the entire mountain. He does everything in his power to protect travelers around his home. Some believe he has the knowledge, if not the means, to banish the Tempest. 16. Lush Lea - These verdant farmlands are home to settlers from the west. They are very superstitious and fear the spirits of the surrounding jungle. 17. Gurunga - Tribes here have legends of men who live underground. They are said to steal children and replace them with changelings. 18. Akandwa - A noble kingdom in the heart of the jungle. Their monarch uses his natural prowess and magic items to emulate the abilities of the savage mantygers who stalk the night. The enchanters here make magic items using a strange metal unique to the area. 19. The Brashwash - This rocky land is unable to support anything but a few fishing villages. The lack of any strong central authority makes it the perfect hiding place for all manner of criminals and malcontents. 20. Greymist Bay - This well defended fortress is a foothold of law for those who travel here from the east. The tables below will hopefully help in generating some interesting situations by rolling on each. Some of the combinations may be vague or nonsensical, but they are meant only to provide the germ of an idea. The basic result is some detail about an NPC and something they want. How an adventure actually starts or who instigates it is not defined and is best left to the individual DM. Maybe whomever completes a number of missions is rewarded a great treasure. Or perhaps it could all be part of an epic quest to find a way to dispel the Tempest Everlasting. A crook'd pentagram to frame. Then they will allow the characters to ask two or three questions to determine some detail about the five aspects of their prophecy. In other words, of the five (Form, Fault, Place, Past, Appetite) they will discuss only a few. The rest is a mystery to be solved through wisdom and endeavor.